BEIRUT - A day of intense airstrikes Saturday on and around the northern city of Aleppo killed at least 45 people, according to opposition activists. The Aleppo Media Center, an activist collective, said 45 people were killed Saturday, just hours after the new U.S.-Russian agreement was reached to try and end the violence in Syria. The Britain-based Syrian Observatory for Human Rights said 30 people were killed in Aleppo province and another 39 were killed by airstrikes in neighboring Idlib province. Contrasting casualty figures are common in the aftermath of large attacks in Syria​. The United States and Russia announced a deal Saturday that would establish a nationwide cease-fire starting on Monday, followed a week later by an new military partnership targeting ISIS​ and al-Qaeda militants as well as the establishment of new limits on the forces of Syrian President Bashar Assad forces. Previous Syrian cease-fires or limited truces have also been preceded by spikes in violence as both government and rebel forces seek to consolidate positions or gain new ground in the final remaining hours of warfare. Saturday’s violence shows that it might be difficult to implement the U.S.-Russia agreement as both countries enjoy limited influence on the government and insurgent groups to cease the bombardment. A cease-fire reached by the two world powers earlier this year and put into effect in late February failed shortly afterward and was followed by months of violence the killed thousands. Russia is a main backer of Assad’s government while the U.S. has been supporting rebel groups trying to remove him from power. Syria’s conflict, now in its sixth year, has continued despite several rounds of peace talks and international attempts to try end the violence. At least a quarter million people have been killed and half the country’s prewar population displaced. Saturday’s air raids were mostly in the northern provinces of Idlib and Aleppo. Aleppo has been the center of violence in Syria in recent months where some 2,200 people, including some 700 civilians, have been killed since last July according to the Observatory, which tracks violence in Syria through a network of activists on the ground. The Observatory and the Local Coordination Committees also reported an airstrike in the Damascus suburb of Douma where the dead included four children. The Observatory said the deadliest airstrike occurred in the northwestern city of Idlib and struck near the main market. The LCC said the airstrikes were carried out by Russian warplanes, adding that they left a number of civilians dead or wounded. An amateur video posted online showed wounded people being rushed away as debris filled a street and fire blazed in some shops and apartment buildings. The video appeared genuine and corresponded to other Associated Press reporting of the events. 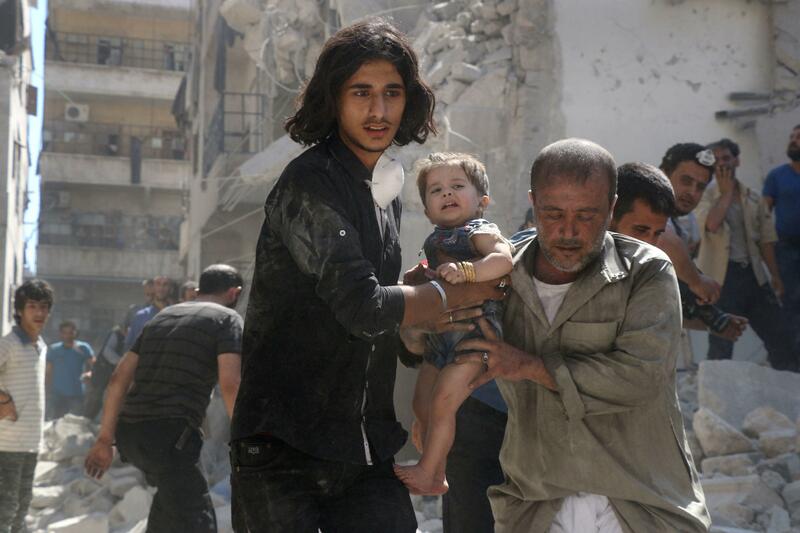 State TV said insurgents shelled government-held neighborhoods in Aleppo, killing one and wounding others. The channel also reported shelling by the Islamic State group on government-held neighborhood in the eastern city of Deir el-Zour, saying it killed nine and wounded 26. The agreement comes at a time when Assad is in a much stronger position than where he was a few months ago. Rebel-held parts of Aleppo are under full siege and two major suburbs of Damascus have been taken out of rebel control after an agreement was reached with the government. A senior member of the main Syrian opposition umbrella group said Saturday it hopes a new U.S.-Russian agreement will be enforced in order to ease the suffering of civilians while an official with al-Qaida’s affiliate in Syria vowed to retaliate throughout the world if the Americans and Russians target them. Basma Kodmani, of the High Negotiations Committee, told the AP that Russia should pressure Assad’s government to abide by the agreement reached early Saturday. The military deal would go into effect after both sides abide by the truce for a week and allow unimpeded humanitarian deliveries to besieged areas around the country. Then, the U.S. and Russia would begin intelligence sharing and targeting coordination, while Assad’s air and ground forces would no longer be permitted to target the al-Qaida-linked militant group of Jabhat Fatah al-Sham, formerly known as the Nusra Front. They would be restricted to operations against the Islamic State. “Very big questions remain surrounding how exactly the U.S. and Russia plan to determine areas where the opposition is sufficiently distant from Jabhat Fatah al-Sham and where they are in fact too close and thus legitimate counter-terrorism targets,” said Charles Lister a Middle East Institute fellow who has written a book on jihadist dynamics in the Syria conflict. Lister said there is no hiding the fact that mainstream opposition forces are extensively “marbled” or “coupled” with Jabhat Fatah al-Sham forces on front lines in southern, central and northwestern Syria. “This is not a reflection of ideological affinity as much as it is merely a military necessity,” he said. Jabhat Fatah al-Sham, one of the most powerful factions in Syria, is part of the Fatah Army coalition that played an instrumental role in the fighting against Assad’s forces over the past year in northern Syria. “We have holy warriors who will burn the ground,” said the official who spoke on condition of anonymity because he was not authorized to speak to the media. He added that the group enjoys fighting the “coalition of the Crusaders” saying they have a large number of suicide attackers for the mission.